Summer has officially started— and PapiBlogger will ride again! For the fourth consecutive year, my wife and our four kids will take to the roads for another epic family road trip, this time in partnership with State Farm and Chevy, from July 5-21. Our family’s destination of choice this year? San Francisco, Yosemite National Park and Northern California! It’s going to be a blast and we want you to joins us for our official send-off party! 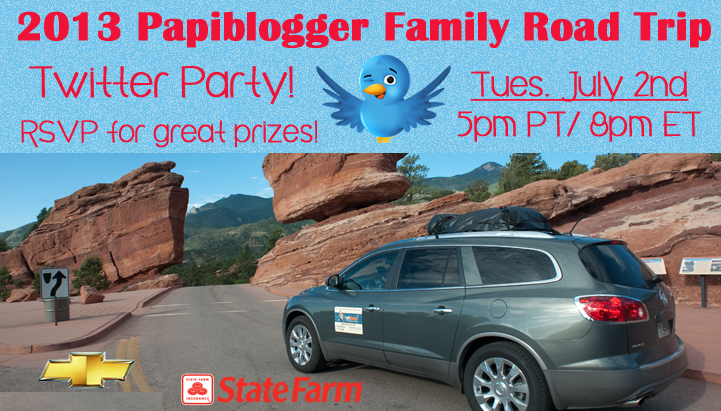 Join us and Hispanicize on Tuesday, July 2nd at 5pm PST/8pm EST for a summer #SFRoadTrip Twitter party! We’ll be sharing road trips tips, the cool benefits of the Chevy Trasverse and talking about the sites we’ll be visiting. RSVP : To be eligible to win prizes, you must RSVP below.